Find artworks, auction results, sale prices and pictures of Antoon Van Dyck at auctions worldwide. Sir Anthony van Dyck STUDY OF A YOUNG MAN IN PROFILE ANTWERP 1599 - 1641 LONDON oil on paper laid down on canvas 16 1/2 by 11 3/4 in. ; 41.9 by 29.8 cm. Provenance Graf Friedrich Moritz von Brabeck (d. 1814), Söder,Hildesheim, before 1800; Thence by inheritance through his daughter Philippine von Brabeck, to her husband, Graf Andreas Otto Heinrich von Stolberg (1786 - 1863), Söder, Hildesheim; His sale, Hannover, 31 October 1859, lot 87 (as Van Dyck); Anonymous sale, Amsterdam, Frederik Muller & Co., 22 November 1910, lot 36 (as Van Dyck); Whereacquired by A.L. Nicholson, London; Ludwig Burchard (1886 - 1960), by 1930, and by descent; Anonymous sale (Property of a Gentleman), London, Christie's, 13 April 2011, lot 95 (as Circle ofVan Dyck); There acquired. Exhibited Museum of Hannover, July 1859, no. 87 (as Van Dyck); Vienna, Vienna Secession, Drei Jahrhunderte Vlämische Kunst, 11 January - 2 March 1930, no. 76 (as Van Dyck). Literature G. Parthey, Deutscher Bildersaal. Verzeichniss der in Deutschland vorhandenen Oelbilder verstorbener Maler aller Schulen,vol. I, Berlin 1863, p. 389, no. 284. Van Dyck painted this expressive head study as a teenager beginning his apprenticeship with Peter Paul Rubens (1577 – 1640) in his native Antwerp. Recently rediscovered, the painting had been enlarged and overpainted by a later, probably 19th-century hand, making Van Dyck\’s original vigorous, wet-in-wet brushstrokes difficult to discern before conservation. 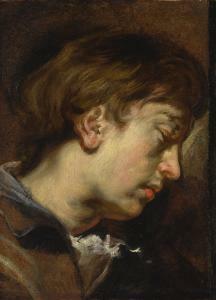 The thick, painterly strokes applied throughout the hair and face of the figure are characteristic of Van Dyck\’s earliest known works, and the figure comes to life through the small touches of color to indicate movement and reflected light, such as on the bottom lip and at the young man\’s collar. Van Dyck would later develop a refined, elegant portrait style for his noble clients, but his early works demonstrate his knowledge of Rubens\’s impasto as well as Caravaggio\’s strong chiaroscuro. The Self Portrait in the Akademie der Bildenden Künste in Vienna (fig. 1), dated to 1613-14, shows a similar fluidity of the paint and even application, compared to Van Dyck\’s later head studies and portraits, which tend to show a more varied texture of paint. Because the present head study was not intended to serve as a finished portrait (reinforced by the fact that it was painted on paper), it captures a fleeting moment and conveys emotion rather than painstakingly records a person\’s features. Its evocative quality aligns the picture with male saints and apostles in Van Dyck\’s early religious paintings, although this particular young man does not appear in any known compositions. In contrast, Van Dyck\’s more formal Self portrait at the Rubenshuis, previously attributed to Rubens himself, shows a smoother paint surface and higher level of individualized detail (fig. 2). Yet the formal portrait shares with the present head study the same use of shadow to create variety in the flesh tones of the face and the same use of dark chiaroscuro in the nondescript background. We are grateful to Drs. 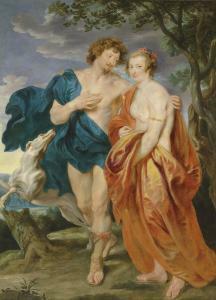 Susan Barnes and Christopher Brown for, independently,confirming the attribution to Van Dyck based on firsthand inspection of the painting, and to Dr. Hans Vlieghe for endorsing the attribution based on photographs. A note on provenance: The first documented owner of this painting, Graf Friedrich Moritz von Brabeck (d. 1814), expanded his family's residence, the Schloss Söder, into its current appearance and transformed it into the cultural center of the prince-bishopric of Hildesheim. He was an art loverwho amassed a collection of around 400 Old Master paintings, most probably including the present lot, and exhibited his collection in Schloss Söder from 1788 for study purposes.His son-in-law, Graf Andreas Otto Heinrich von Stolberg (1786 - 1863), whose only son had died in 1840, sold the entire collection in 1859 and then sold the estate in 1862. Later owner Ludwig Burchard (1886 – 1960) was a German-born art historian and a leading Rubens scholar of the 20th century. After his death, his collection of scholarly material became the foundation for the Corpus Rubenianum Ludwig Burchard, one of the largest series ever published on a single artist, and which is still expanding today. PORTRAIT OF A WIDOWED LADY, THREE-QUARTER-LENGTH, HOLDING A GLOVE AND A FAN Sir Anthony van Dyck ANTWERP 1599 - 1641 LONDON oil on canvas 104.4 x 76.8 cm. ; 41 1/8 x 30 1/4 in. Provenance Palazzo Borromeo, Milan, whence acquired,circa 1880–90, by James S. Budgett, Stoke Park, Guildford; Thence by descent. Literature S.J. 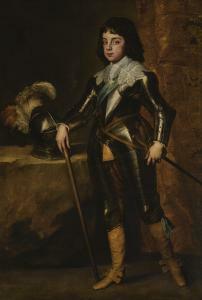 Barnes, O. Millaret al.,Van Dyck. A complete catalogue of the paintings, New Haven and London2003, p. 228, cat. no. II.102, reproduced. Catalogue Note This painting was rediscovered not long before it waspublished for the first time in the authoritative Van Dyck monograph(see Literature). It is a portrait that dates to the time that the young Van Dyck spent in Genoa, where he arrived in November 1621 for 3 months, aged only 22, before returning in 1623 to spend much of the next four years there. During this comparatively brief period Van Dyck secured his reputation largely through painting portraits of the Genoese nobility, whose taste had already been informed by his master Rubens\’ sojourn in the city in 1605–06. The painting is closely related to two other Genoese portraits of widows by Van Dyck, one in the Gemäldegalerie, Berlin,1 the other in the Musée des Beaux-Arts, Strasbourg.2Although almost none of Van Dyck\’s Italian portraits are signed or dated, it is believed that all three of these likenesses were executed early on in his time there. The structure and position of the lady\’s right hand here, for example, is particularly characteristic of his Genoese paintings of this date. While the women in the two aforementioned portraits gaze directly out at the viewer, this lady, a generation older, turns beyond the frame, apparently lost in thought. 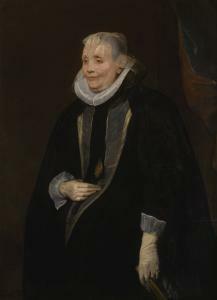 The sympathy with which Van Dyck portraysthe widow in her relative old age is distinctive, and reflects a facility that the artist appears to have had for depicting the elderly even early on in his career. The lady\’s veil, collar, and the V-shaped piece that comes down from her shoulders to her stomach, are all remarkably similar to the costume worn by the widow in the Strasbourg painting. James S. Budgett owned a number of Italian Renaissance paintings, including an autograph version of Granacci\’s Rest on the Flight into Egypt and a cassone by Biagi d\’Antonio, formerly attributed to Botticelli, as well as an early watercolour by Turner– Geneva and Mont Blanc from the Lake. An undated, late 19th-century receipt in the archives of Budgett\’s descendants describes the present portrait among a group of other pictures purchased for 15,000 Italian lire, while the picture still hung in the Borromeo Gallery (now the Galeria Ambrosiana) in Milan. 1 Inv. no. 782 C; see Barneset al. 2004, p. 227, cat. no. II.100, reproduced. 2 Inv. no. 200; see Barneset al. 2004, p. 184, cat. no. II.38, reproduced. 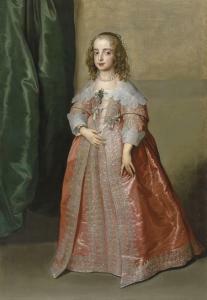 Sir Anthony van Dyck (Antwerp 1599–1641 London) Portrait of Princess Mary (1631–1660), daughter of King Charles I of England, full-length, in a pink dress decorated with silver embroidery and ribbons oil on canvas 62 ¼ x 42 ¾ in. (158.2 x 108.6 cm.) Provenance Commissioned for the Stadtholder\’s court at The Hague, in 1641, presumably by or for the sitter\’s husband, William II, Prince of Orange (1626–1650); possibly recorded in the 1654 inventory of the collection of the sitter\’s mother-in-law, Amalia van Solms (1602-1675), at Huis ten Bosch, The Hague, as \‘Een schilderije van princesse royale, mede bij Van Dijck gedaen\’; possibly recorded in the 1695 inventory of the Stadtholder\’s collection at the Oranienstein Palace, as \‘2 grosze stücke presentirend printz Wilhelm der 2te von Oranien und desen frau, die princessin royale, in lebensgrösze\’. J. Gadney; Sotheby\’s, London, 15 December 1976, lot 59. Anonymous sale; Christie\’s, London, 17 November 1989, lot 41, when acquired by the present owner. Sir Anthony van Dyck (Antwerp 1599-1641 London) Double portrait of George Villiers, Marquess and later 1st Duke of Buckingham (1592-1628) and his wife, Katherine Manners (1603-1649), as Venus and Adonis oil on canvas 87 ¾ x 64 1/8 (222.9 x 163 cm.) Provenance Frederick Hall Standish (1799-1840), Duxbury Hall, Lancashire, as \‘Rubens and his wife\’, by whom bequeathed to the following, Louis-Philippe, King of the French (1773-1850); his sale (†), Christie\’s, London, 28 May 1853, lot 37, as 'Rubens and his wife' (20 gns. to Arthur[?]). T.A. Houghton, Armsworth House, Hampshire; Christie\’s, London, 28 June 1918, lot 79, as 'Rubens and his wife' (7 gns. to Van Slochem[?]). Private European collection. with Harari & Johns Ltd., London, by 1990. with Derek Johns, London, 10 December 1999, from whom acquired.